Ever been in an authentic restaurant and wished you had a sushi dictionary? The words seem deceptively simple, but when pricey raw seafood is at stake, there is little room for error! What began as an eat-with-the-fingers fast food in Japan a long time ago has grown into an international craving. Sushi has a fanatical following—either you're dreadfully addicted or just don't get why people would want to pay so much for mostly uncooked fish. Knowing some of the more useful sushi terms will enhance your experience, as will knowing how to eat sushi the right way. If you're already plotting a run to the nearest restaurant after reading this, then take your favorite food to the next level by learning the associated Japanese words for sushi. Although the term “sushi” is now used as a generic word to refer to the entire genre of food, the original term was meant only for the sticky, vinegared rice. The uninitiated often refer to all raw fish as “sushi,” however, plenty of cooked and even vegetarian/vegan versions of sushi exist. 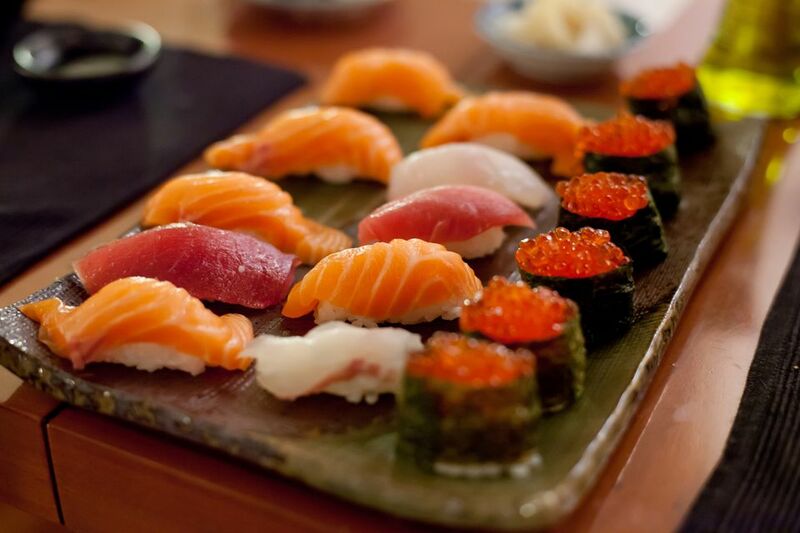 Although the different varieties of fish are typically served raw, octopus, eel, and other types of sushi are sometimes cooked because of the texture. The correct term for a piece of seafood (usually raw) sliced thin and served without the accompanying rice is sashimi. Chopsticks (preferably not the throwaway kind) are used to eat sashimi, meanwhile, other types of sushi can be eaten with the fingers. Knowing a little chopstick etiquette is good for formal or authentic dining settings. For instance, pointing with your chopsticks in hand and saying "you've got to try this!" is bad etiquette with or without a mouthful. Maki: What most Americans think of when they hear the word “sushi,” maki actually means "roll" in Japanese. Maki refers to any type of sushi created with a makisu, the bamboo mat used to roll sushi. Maki rolls are usually cut into 6–8 pieces. Nigiri: A strip of vinegared sushi rice with a piece of fish expertly pressed to stick on top. Sometimes octopus or eel are served atop rice. A piece of nori seaweed may sometimes be used to keep the fish on top. Nigiri should be eaten with the fingers. If soy sauce is applied, flip the piece of nigiri upside down so that only the fish is dunked, allowing the rice to remain intact. Hosomaki: The smallest maki rolls, usually with a crunch inside. They contain fewer ingredients and have only nori seaweed on the outside. Futomaki: The largest maki rolls, cut thinner due to their size. Futomaki rolls are traditionally eaten uncut during the evening of Setsubun in some regions of Japan. Sashimi: Often incorrectly referred to as sushi, sashimi is just slices of raw fish served without rice. Sashimi is normally eaten with chopsticks rather than the fingers. Temaki: A temaki is a cone-shaped hand roll around four inches long made of nori seaweed and filled with rice and fish. Temaki is often eaten as a form of sushi on the go. Uramaki: Not traditional or very Japanese, uramaki rolls are “inside out” with the nori seaweed wrapped around ingredients in the middle and rice stuck to the outside. Sesame seeds or roe are often stuck to the rice, making them messy to eat with the fingers. Chirashi: Not so common outside of Japan, chirashi is a bowl of sushi rice topped with a variety of sashimi and garnishes. Nori: The dried, black-and-green seaweed used in sheets to create sushi. Nori was once scraped from docks and dried in the sun; today, it is farmed. Roe: Fish eggs put on top of sushi to add color, texture, and saltiness. Roe is used from a variety of creatures, particularly flying fish (tobiko) and sea urchins. Hashi: The Japanese word for chopsticks. Chopsticks are used for eating sashimi; other forms of sushi should be eaten with the fingers. Makisu: The bamboo mat used to roll makizushi. Kaiten Zushi: Known as “sushi train” or "conveyor belt" sushi, these restaurants allow diners to select what they want as plates circulate on a conveyor belt. Plates are often color-coded by price. The first conveyor-belt sushi eatery opened in Japan in 1958. Itamae: The title given to a professional sushi chef. Sushi chefs are respected as artists. The primary component in a piece of sushi, particularly nigiri, is referred to as the neta. Maguro: Tuna (many different words denote species and cuts of the tuna). Toro: The fattiest part of a fish, most often tuna; it is usually the most expensive and sought-after piece. Saba: Mackerel (usually sliced with some skin on one side and served as sashimi). Sake: Salmon. Yes, it's the same word for the fermented rice spirit but pronounced slightly differently, sometimes as "sha-keh." Salmon was actually introduced as a sushi ingredient in Japan by a Norwegian entrepreneur in 1980s! Unagi: Freshwater eel; anago is sea eel. Unagi is usually grilled and drizzled with a sweet sauce rather than eaten raw. Tamago: Sweet egg; tamagoyaki is used to refer to the sweet, square omelettes. Surimi: Imitation crab or lobster meat made with fish paste (often pollock or cod). Kani kama is a term for imitation crab meat. Wasabi: A term used for the spicy, green paste provided with sushi. Real Japanese wasabi root is perishable and expensive, so dyed horseradish is often substituted instead. Wasabi was originally used as an antimicrobial agent to accompany raw fish. The correct amount of wasabi is already applied by sushi masters; adding more in a nice restaurant can be viewed as bad etiquette. Gari: Sliced, pickled ginger served with sushi. Gari is used to clean the palate between different types of pieces. Ginger also aids digestion and helps to kill microbes in the raw fish. Never eat the ginger at the same time as a bite of sushi! Daikon: Not to be confused with ginger, daikon is a white radish with a mild taste that is often grated as a garnish to provide a crunchy texture. Pickled daikon is referred to as takuan in Japanese. Edamame: Young soybeans, steamed or boiled in the pod, are often served as a snack to accompany sushi. Sake: Properly pronounced "sah-keh" not "sah-key." Fermented rice wine served either warm or cold. Sake can have an alcohol content as high as 20 percent. In some authentic sushi experiences, you can compliment the chef by buying a shot of sake. Agari: Green tea. Mecha is the good stuff, slightly bitter, used to clear the palate.